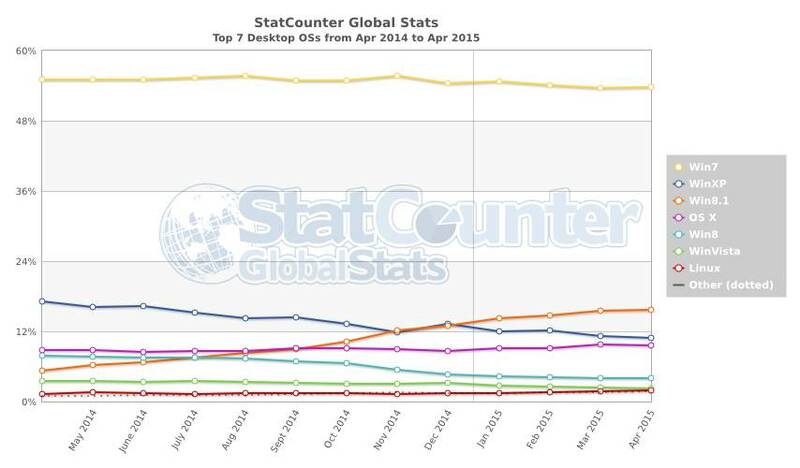 If it's the first Monday of the month, and it is, it must be time to have a look at desktop operating system market share as recorded by StatCounter and Netmarketshare. It looks like the skids are really under Windows XP now. Netmarketshare has it down from 16.94 per cent to 15.93 per cent. StatCounter has a dip to 10.91 per cent, down from March's 11.21 per cent. We know there are still big corporate XP users out there, such as the operator of the infamous Fukushima nuclear power plant, and there are anecdotes-a-plenty to be had about pirated XP in developing nations. Perhaps the move's finally on? If so, the two click-counters' data doesn't quite explain where users are going. Both report a small spurt of growth for Windows 7, which StatCounter has at 53.81 per cent, up from 53.66 per cent. Netmarketshare records a similar jump, from 58.04 per cent to 58.39 per cent. Windows 8.1 is also growing, to 15.76 per cent market share according to StatCounter and 11.16 from Netmarketshare, up .61 and .25 of a point respectively. Windows 7's dominance of the desktop shows why Microsoft will make users of the OS its first migration target for Windows 10 upgrades. But with Windows 7 still growing, will users want to make the jump? The XP experience shows that without a compelling reason to upgrade, plenty of users are very happy to hang on to operating systems that may not have all of Microsoft’s newest baubles, but do get the job done. Whoa - is that an Access 97 iceberg dead ahead?